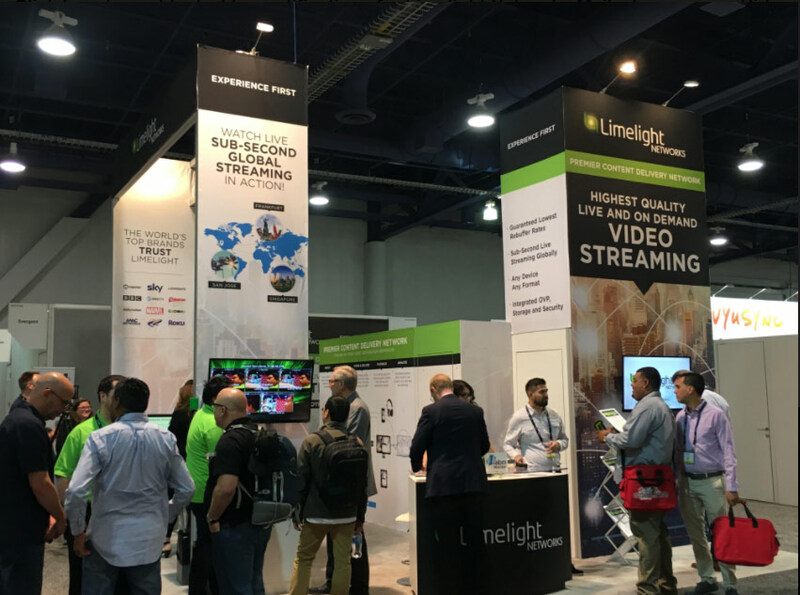 Limelight went big with our presence at NAB this year- including featuring an important live demo of our new sub-second latency live video streaming solution. Zooming in on what the monitor is displaying, the top three windows show the WebRTC sub-second streams from San Jose, Frankfurt, and Singapore and the measured latency. The bottom two windows show the video delivered by today’s pervasive HLS 1 second chunk, and HLS 10 second chunk streaming respectively, for comparison purposes. Note the dramatic difference in latency compared to sub-second WebRTC, of HLS delivery of several seconds to over 30 seconds. Visitors who watched the demo were excited by the new business models that this technology enables. Casinos will be able to offer online games to players anywhere in the world with the same fast action enjoyed by those in the casino – eliminating slow play times while waiting for the online video feed to show what is happening on the actual game table. Online players will be able to play live alongside those at the table in the casino. Other use cases include online participation in live auctions, significantly improved second screen live sports viewing without the usual time gap between the broadcast and live stream of the event, and improved fast action with online multiplayer video games. In addition, Limelight’s Charley Thomas moderated a panel discussion on low latency streaming technology. The panel members were from organizations delivering low latency streaming in production today, and articulated their strategy for migrating to the newest real time low latency streaming technology as soon as it becomes available. Based on comments from booth visitors on the various challenges they face in distributing video to their audiences, protecting licensed and in-house created content remains a challenge. Digital Rights Management (DRM) is a popular way to secure digital content, but can be complex to implement. So, it was topical that Limelight’s Multi-DRM capability was also among the solutions highlighted. We have simplified the implementation of DRM for customers with a solution that includes support for the popular DRMs with required license servers, and is integrated with our CDN. Rounding out our announcements was new live to video on demand recording capability, complementing live streaming delivery with ways to increase monetization of the content with on demand viewing. And finally, significant enhancements to the Limelight online video platform, based on feedback from the customer base, were announced. Both of these new solutions will be available in the first half of 2018. Watch for the launches of these new capabilities throughout 2018 as Limelight delivers game changing technology that will enable exciting and lucrative new business models. For more information on low latency streaming and our NAB announcements, read the Low Latency Live Video Technology Brief and the NAB Press Release.